Ernest James Butler was born in Oxford in 1895, the son of James Butler (born in Kidlington in 1868 and baptised there on 14 June) and Emily Jakeman Bryan (born in Headington on 11 October 1869 and baptised at St Andrew’s Church on 28 November). His mother was the illegitimate daughter of Sarah Bryan, who had obtained an order of affiliation against George Jakeman on 22 January 1870. At the time of the 1891 census Ernest’s father James Butler (22) was an agricultural labourer, living with his parents at Lyne Road, Kidlington, while Ernest’s mother Emily Jakeman Bryan (21) was working as a general servant at 10 St Margaret’s Road in north Oxford. Sidney Butler (born at 53 Percy Street in East Oxford on 11 January 1901 and baptised at SS Mary & John Church on 28 February). Ernest’s parents began their married life in Kidlington in 1892, and were still there at the end of 1893; but by the time Ernest was born in November 1895 they were living in Oxford, and at his baptism their address was given as 50 Charles Street in east Oxford. At the time of the 1901 census Ernest (5) was living at 53 Percy Street, also in east Oxford, with his parents and his brothers Percival (7) and Sidney (three months). His father was then working as a builder’s carter. By 1911 Ernest (15), who was working as a page boy in a refreshment department, was living at 73 St Mary’s Road, again in East Oxford, with his parents and his two brothers: Percival (17) was now working as an errand boy for a boot shop, and Sidney (10) was still at school. Ernest James Butler volunteered to serve in the First World War, and was as a Private in the 5th Battalion of the Wiltshire Regiment (Service No. 10868). He was wounded in early 1915 and came home, but went back to fight again, and was killed in action in Mesopotamia (Iraq) at the age of 20 on 9 April 1916. He was buried in the Amara War Cemetery (XVI.K.12). Soon after 1916 his parents moved up from east Oxford to Headington, where they lived at 59 Windmill Road (now part of Blanchford's). The east side of Windmill Road is in Quarry parish, so although Ernest himself never lived in Headington, he is remembered on the stone plaque in the porch of Holy Trinity Church in Quarry. James Butler died at 59 Windmill Road at the age of 53 and was buried at Holy Trinity churchyard on 26 March 1921. Mrs Emily Butler opened a grocer’s shop at 59 Windmill Road in 1922, and this shop continued to be listed in Kelly’s Directory right up until 1954. She died aged 84 on 24 January that year, and was buried with her husband in Quarry. Percival George Butler (born 1893) married Hetty Mary Ann Robinson at Holy Trinity Church, Headington Quarry on 7 November 1920. 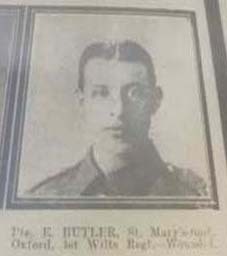 Their son Keith J. E. Butler was born in 1930 but died aged nine on 30 April 1940. Percival’s wife Hetty died at the age of 76 in 1967, and Percival, who was living at 89 Lime Walk, died at the age of 86 in 1980. All three are buried together in Holy Trinity churchyard.